Ok so now you have the basics down as far as what you think you want to a pond. Size, depth, location is just where you start. After you decide that then is the fun stuff. Not everyone includes a waterfall when they build a pond, and it can be added later. 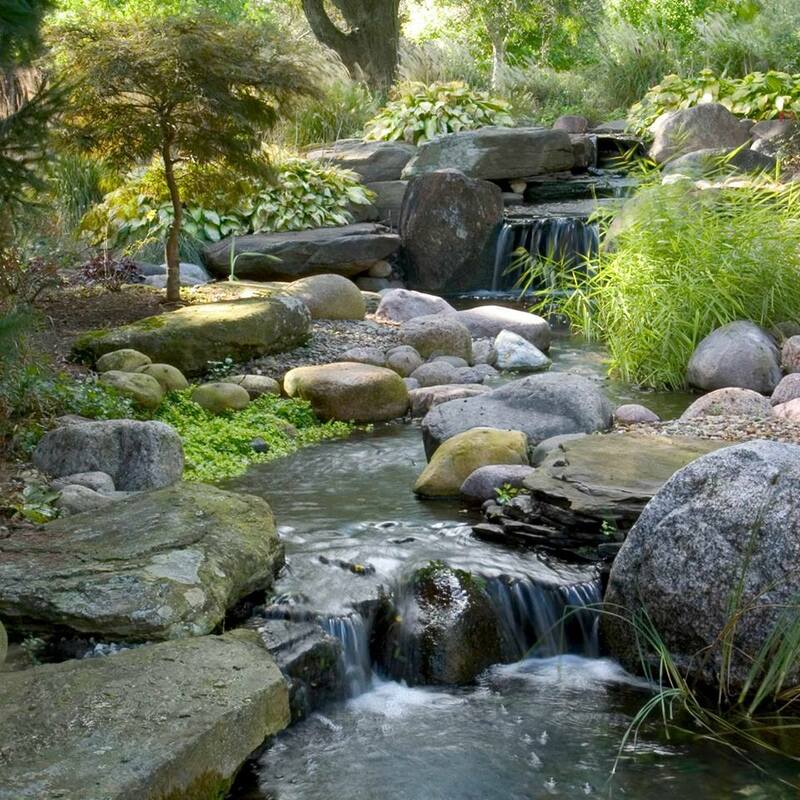 But Waterfalls provide valuable aeration to your water feature while creating the soothing sound of running water. Especially if you are going to include fish like Koi or goldfish you will really want to consider adding a waterfall. 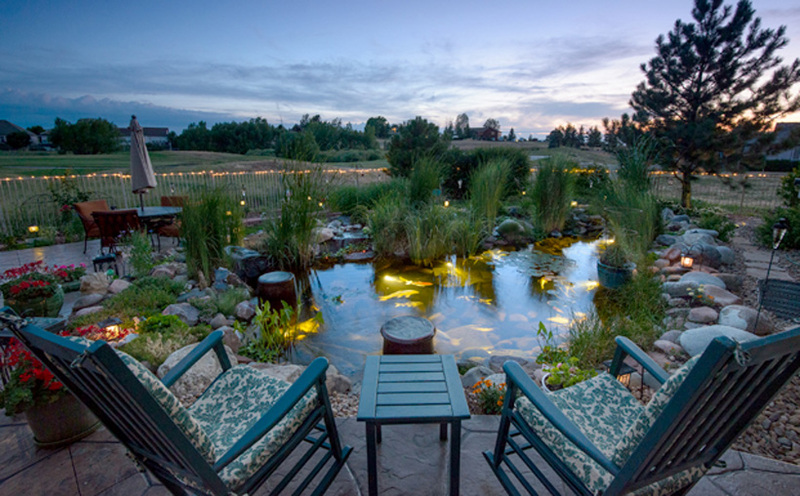 Adding garden and pond lighting extends your viewing pleasure well into the evening hours. Lights placed behind waterfalls create drama during the nighttime hours. Underwater lights at the edges of the pond reflect off the fish as they swim by. Set your lights on a timer so you never have to worry about turning them off and on. Make your pond the nighttime focal point! Pond plants help your water garden in so many ways. So go ahead and splurge on a beautiful water lily. Not only will it add gorgeous color to your pond, but the lily pads help shade the pond and give your fish a place to hide from predators. Available in hardy and tropical varieties, you’ll find an endless assortment of water lilies. They do best in depths of 18”-30”. If you are thinking you may like a pondless or shallow pond there are many bog plants that will add life and beauty to your pond. Cattails, water iris, pennywort, papyrus and ribbon grass are just a few. Adding fish to your pond is a great way to enhance the water feature lifestyle. You’ll enjoy feeding them at the pond’s edge and will feel the stress melt away as you watch them swim about. Why do you think so many doctors’ offices have aquariums? To help you relax! You can find a huge selection of suitable fish for your pond. Koi, goldfish, golden orphs, hi fin banded sharks, plecostomus, tadpoles, frogs and turtles to name just a few that we have and recommend. Have you thought about adding a fountain? Fountains not only add beauty to your pond, but they provide valuable aeration as well. If you think your existing waterfall isn’t adding quite enough oxygen to your pond, consider adding a fountain. You can place it in the center, or near the edge of a pond for drama. If a fountain is too big you may like the size and scale of a whimsical spitter. Everyone wants an algae-free pond and the Aquascape IonGen® electronic algae controller effectively kills string algae without the use of traditional liquid chemicals. It is fully adjustable to add just the right amount of protection. If it is green water that haunts you then consider installing an U.V. clarifier. It can be part of your filter system or installed inline. It will make green water a thing of the past. In most cases a filter is a must. It can be installed as part of your waterfall or an external unit. You can also install a filter in the pond but it is not recommended. It is not very effective and difficult to clean properly. 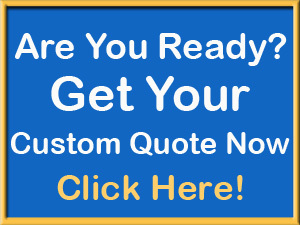 1 Response to "8 things to consider before you build a pond"
Hey thank you, I got a lot of good information just now here visiting your website.. I have a question. I live in Menifee CA . It’s southern CA just before San Diego. I’m between the coast and the very hot desert. I have two red eared slider turtles in my pond a friend of mine built me when that friend was here visiting. Do I need to use a heater in winter to keep my turtles healthy and happy? ?